← Brooklyn people are crazy! 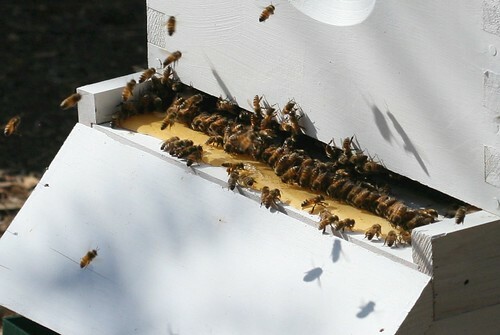 During my hive inspections, I’ve started placing a line of honey along the front entrance. I figure it helps keep the girls occupied, and who knows, they may even start associating an inspection with a treat of honey. I always get a laugh when I see them come out of the hive and start taking up the honey. They really remind me of pigs at a trough. We finally had a break in temperature today, and it was a beautiful 75 degrees when I checked on the hives. The ironic part is a good chunk of the Austin area is on fire right now as the cold front brought it gusty winds and lowered the humidity considerably. It would have been really nice if Tropical Storm Lee had decided to go through Texas as opposed to the other Gulf Coast states. That is so cute, Karl! Oink! That is pretty cute. And I have to ask – you don’t have problems with robbing? I haven’t had a problem with robbing yet. I have two hives about 5 feet apart and I put honey on the front entrance on both of them at the same time before I start the hive inspection. It probably takes less than 5 minutes for the girls to clean up the honey so I don’t think it is out there long enough for a robbing situation to happen. We have been in a dearth for quite some time now since it hasn’t rained in many many months which is causing all the crazy fires around the city. I’ve been doing this for at least two months now without any issues so who knows.